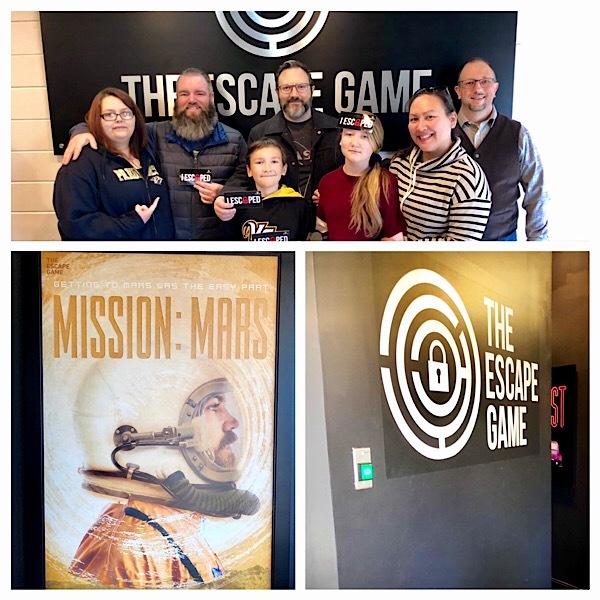 Our nephew, Keith, invited us to one of the The Escape Game adventures. These are really popular and I can see why. Anyone who was a fan of point-and-click puzzle computer games (like me) would love getting to be inside the game and that’s exactly what this feels like. My older brother, Stephen, and Keith’s fiancé, Jamie, joined us and we had a great team. We were able to divide up for different tasks and finished with over 11 minutes to spare for our Mission to Mars adventure. The entire facility is really nicely done and it’s easy to get caught up in the fun and pressure of trying to solve the puzzles together in under 60 minutes. Author Jason ColemanPosted on Saturday, January 26, 2019 Monday, April 8, 2019 Categories GeneralTags fun, kidsLeave a comment on We Escaped! No, not that I tried eating hot chicken. Having lived near Nashville for over a decade, of course we’ve eaten hot chicken. Though, I don’t ever order the crazy hot stuff. I stick to mild and actually enjoy eating it. No, I mean I tried making my own hot chicken here at home for family dinner. It’s no secret that cooking isn’t something I really enjoy. I’m starting to enjoy it more as I’ve learned to successfully cook some things beyond a cold-cut sandwich. Angela really enjoys cooking (and is also really good at it), but her style is more of experimentation. I’m one who can follow directions so if they’re clearly written, then I can generally pull it off reasonable well. A few years ago, we started Blue Apron meals and more recently made Hello Fresh meals. Both are great and I learned a lot about cooking (and also learned I wouldn’t last a day in a professional kitchen setting). I also learned about frying a bit more. Doing some more research, I found a really good Bobby Flay recipe for fried chicken. More importantly, frying chicken for chicken parmesan – one of my all-time favorite dishes. So I got some practice making that at home. 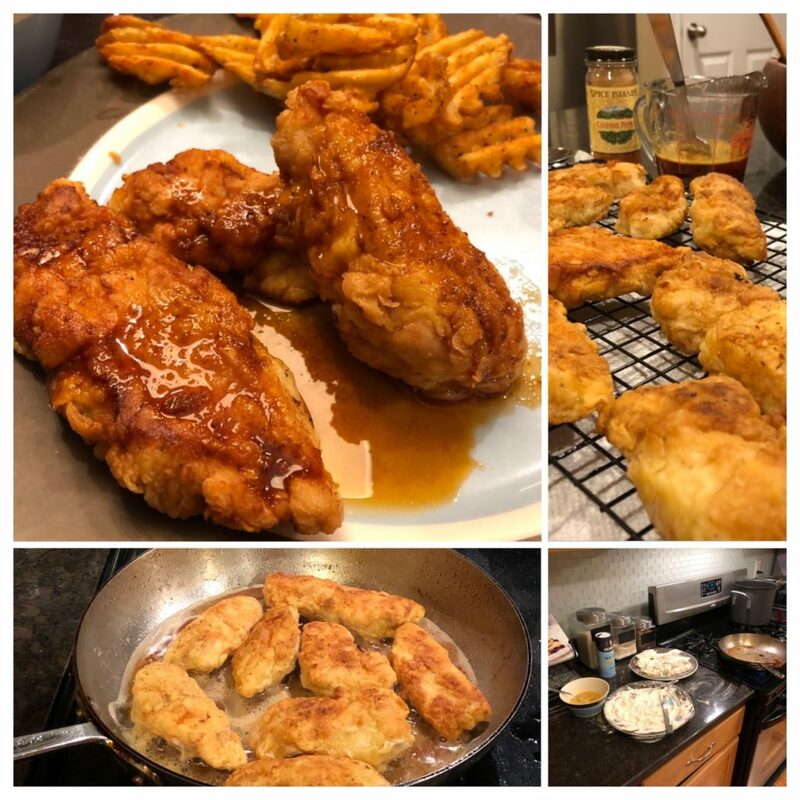 Angela suggested I try making some hot chicken and I found a copy-cat recipe for Hattie B’s chicken which is arguably just a copy-cat of Bolton’s, but that’s for another day. I used a lot less cayenne than the recipe calls for (that much is crazy) and I used the frying oil as the base for the hot coating. Therefore, mine is a lot browner and runnier than most glamor shots of hot chicken. But it did taste pretty good and the whole family enjoyed it. Christmas in 2018 was a lot of fun and my family got me a lot of wonderful things. Among them, my brother, Dave, got me a guitar pedal effects kit. This was a tremolo pedal, which is definitely something I wouldn’t have gotten myself. If you don’t know, a tremolo pedal modulates the amplitude of the signal. That is, it’s as if someone is turning the volume knob up and down regularly. This effect was built into many early electric guitar amplifiers. In the late 50’s an Australian electronics magazine had an article on a relatively simple circuit for this effect. That design has since been modified and incorporated into many popular guitar effects. 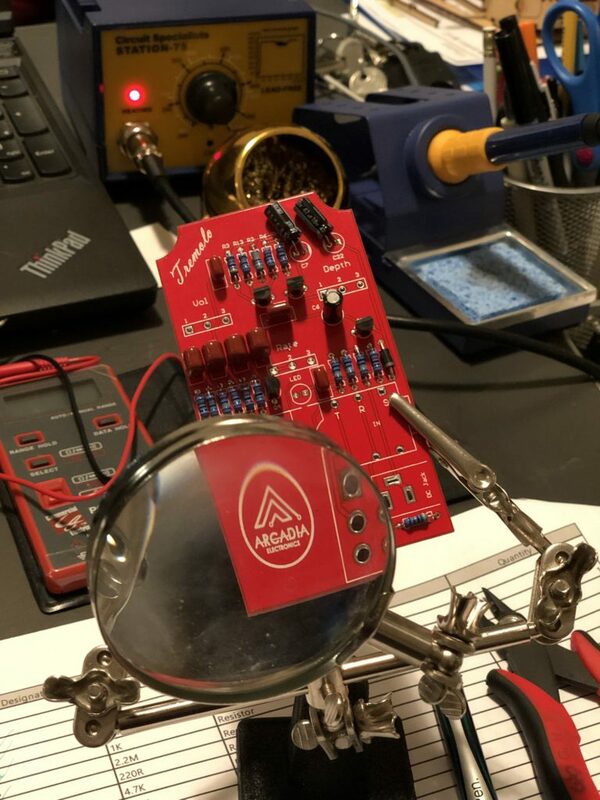 The kit I got is by Arcadia Electronics and uses the EA Tremolo design. This kit has all of the components, even jacks and switch, all directly soldered onto the printed circuit board (or PCB). This simplifies building and is, in fact, what most commercial pedals utilize to speed up fabrication (and even allow for automated component soldering). As such, it was a relatively straight-forward build process that probably took me under three hours total. And mind you, I am intentionally slow with this things because I want to really enjoy the process and also to prevent making any easy avoidable mistakes. Populated PCB for the Acadia Tremolo pedal. You can see that I intentionally bent over a couple of the electrolytic capacitors to keep them well clear of the Depth control potentiometer. The instructions with the Acadia kits are very sparse. They basically include of a printout of the PCB (which is very nicely screen printed and clearly marked, though) and a component list. That’s it, there’s no other instructions or build steps given. So, if this was a kit for a new builder, I’d suggest downloading the instructions for one of the other Tremolo pedals at Mammoth Electronics. They’re generally similar builds and provide some good information if you’re new to pedal building or electronics. The Acadia kit came with high quality components. I tested some of the resistors and they were closer to nominal values than the ones I purchase. The single diode in the kit had legs that really didn’t fit into the drilled through holes, but I just swapped it out for another 1N4001 in my parts bin. It’s not that the part was cheap; just that the pcb design as-drilled can’t accommodate this particular part. There’s probably several solutions to this, but this would be pretty frustrating for a first-time builder, I think. Otherwise, I really have no issues with this kit. It’s the first pedal build I’ve done that I didn’t have to troubleshoot at least one mistake! 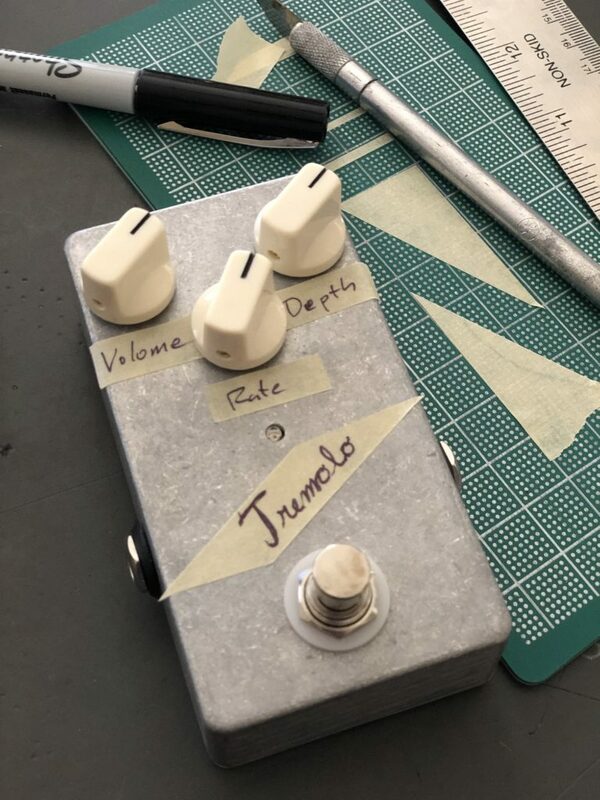 I labeled the pedal once it was all closed up for testing. I’ll paint and decorate the case another day. I got the hardware all soldered onto the board. I did add some electrical tape to the back of the pots as well as to the inside of the case back. This is probably not necessary, but I wanted to prevent any possibility of the pots or components grounding out. The pedal sounds great. The volume boost on this was pretty surprising, in fact. Just dialing the Rate and Depth controls to zero makes this a pretty effective clean boost, even. The range of the tremolo is all the way from nothing to complete volume clipping. I recorded a fairly poor sample for this post, but the sound is really great in person. The other evening, I heard a thud and an “uh-oh” from my 11yo daughter’s room. Turns out, when hopping on to the bed to read that night, the bed rail snapped. The bed rail was made from pressboard, veneered to look like the rest of the furniture (which I think is of slightly higher quality). 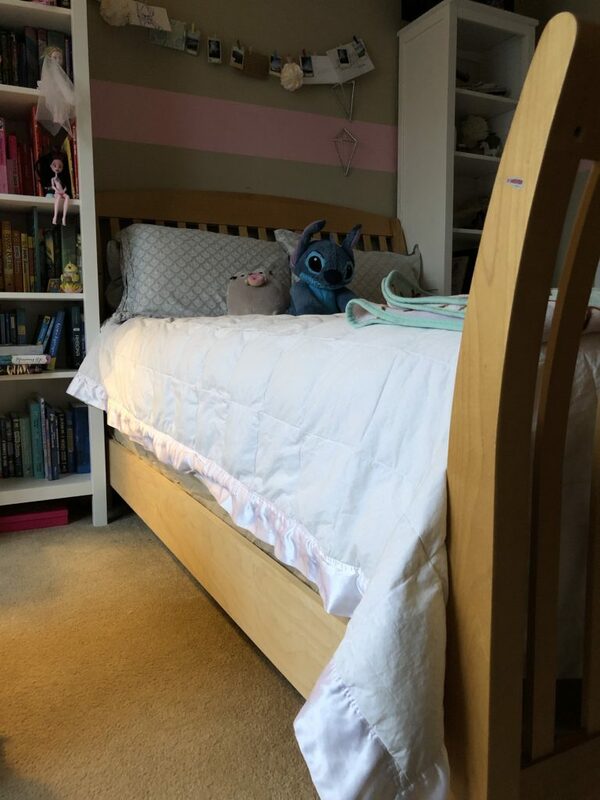 Our daughter felt terrible about breaking the bed, but in reality it’s a wonder it lasted for the 7 years it did. An average size toddler could break this stuff, let alone an average size 11 yo girl. The pressboard had cracked in two pieces, right through one of the screw holes for holding the slats. We considered purchasing a new IKEA bed or similar, but she said she really like this bed and would prefer if we could just fix it. Maybe that was partly her still feeling bad for having done it, despite my wife and I assuring her it wasn’t really her fault at all. 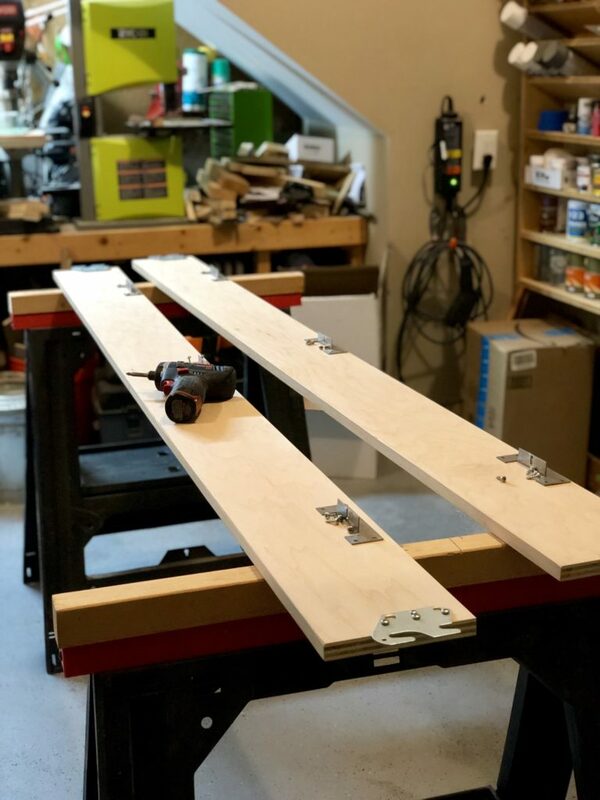 The only downside to this was that I was going to have to purchase a full size sheet of plywood at the big box store to get the 6′-6″ rails out of them. I normally have the store cut the board along the short dimension, so that it’s less than 7′ long as to fit into my Honda Pilot. However, in hindsight, I should have had them then rip down some strips to make it easier to manage. A 6′-8″ by 4′ sheet of 3/4″ plywood is only slightly easier to manage by yourself than a full size sheet. I did get to try my hand at edge banding the plywood. Edge banding is a narrow, thin strip of veneer (almost exactly like the surfaces of hardwood plywood) that has a heat-activated glue on the backside. You simply iron-on this to the edge of your cut plywood.1 It’s actually a lot of nice furniture and cabinetry is made and it’s a pretty amazing transformation. Of course, it’s also how a lot of cheap furniture is made, too, but that’s often a plastic veneer rather than actual hardwood. I couldn’t find maple veneer at my big box store, so I took a trip to my local Woodcraft shop. There, I also got a self-centering drill bit. I’d always considered one of those to be for someone who makes a lot of furniture or cabinetry, but it’s worth it to buy some even for DIY’ers like me. It’s a huge timesaver for mounting hardware and really makes the process more accurate. So, I ripped down the nearly full sheet of plywood on my little band saw. 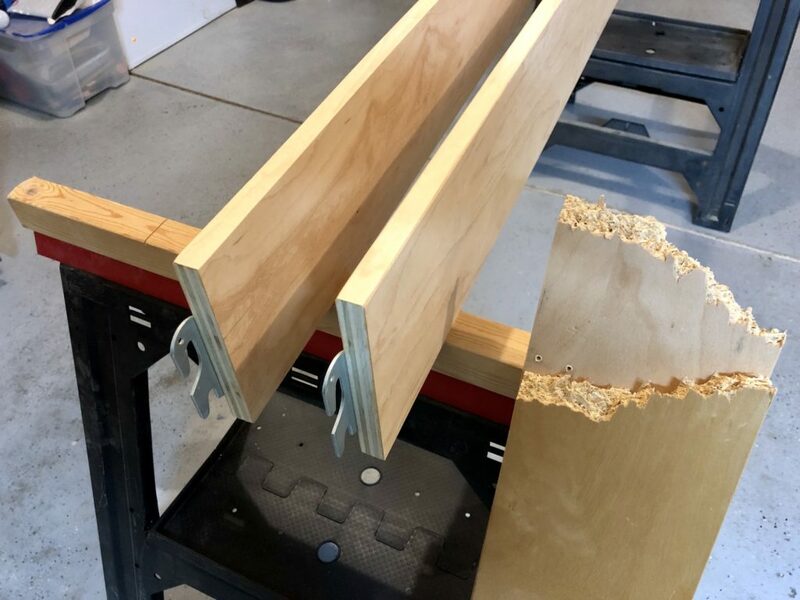 Again, I should have had the store cut this down, because it’s just not easy for one person to do this on even a high-end cabinetry saw, let alone a my small Ryobi2. It resulted in some not-so-straight cuts, but they were good enough for this as I wasn’t jointing anything. I straightened out some of the bend metal slat supports in my machine vice and then got all the screw holes drilled out. I did a small test piece with the edge banding and tried using one of those spring loaded edge banding trimmers. The banding went on easy, but the trimmer was not so great. It ended up tearing the banding in a lot of places. I still tried using it one the first rail, which was a mistake. When trying to sand everything, the orbital sander grabbed one of those tears and ripped off a huge chunk of the banding. Fortunately, I was able to cut out that piece by re-heating the glue and Angela helped me put on a patch. 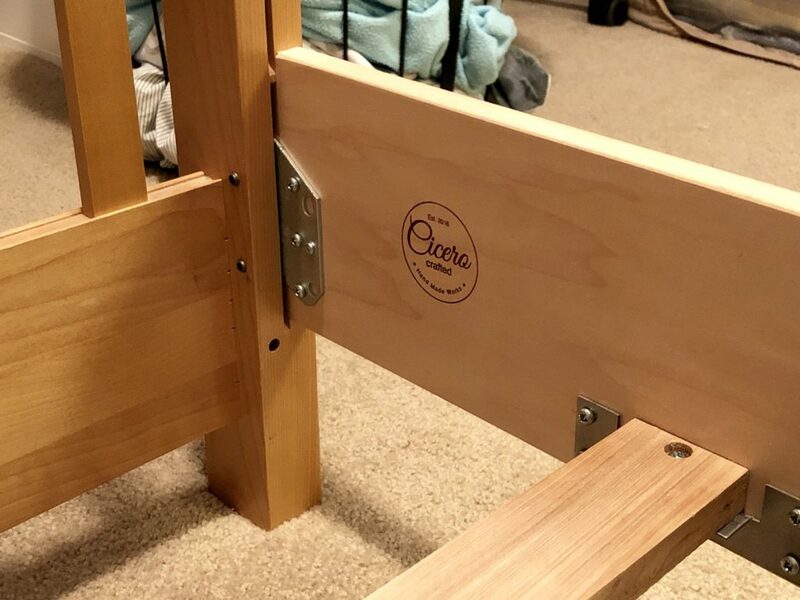 It ended up looking just fine for our kid’s bed, but I learned my lesson. For the second rail, I simply flipped the piece over and cut along the edge with a box-cutter blade. I then lightly sanded over the corner with a sanding block. I used a single (though pretty heavy) coat of wipe-on polyurethane for the finish. The final step was to stamp the work and then it was ready for assembly this afternoon. The final clip sliding in to place was so satisfying! The maple matches the furniture, but of course it will have to darken over time with exposure to light to fully match. But, I’m pleased with the final result and I’m confident this will last longer than the original.